The JET-SET® MOD-2E-21 unit is an electrically activated module package containing two JET-SET® 9100 pumps capable of supplying up to 10 nozzles. The electric solenoid in the module is wired into the machine so that a shot of lubrication is given at the beginning of each cycle. The MOD-2E-21 comes standard 110v unless specified. 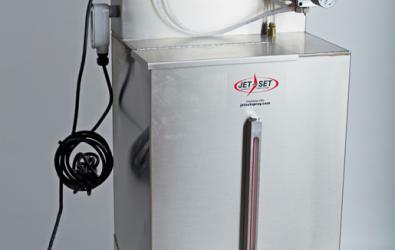 All JET-SET® pumps provide easy volume regulation by turning the large knob on top of the pump. You can regulate the output from 0 to 5 cc per cycle. MOD-2E-21 may also be supplied with a 1401 timer or 1471 counter unit or both, to either count cycles or give more than one shot per cycle.